Cleveland transplant Adam Mesnick is expanding his culty sandwich empire. This new addition is a casual, diner-style sister space to his SoMa original, DeliBoard. 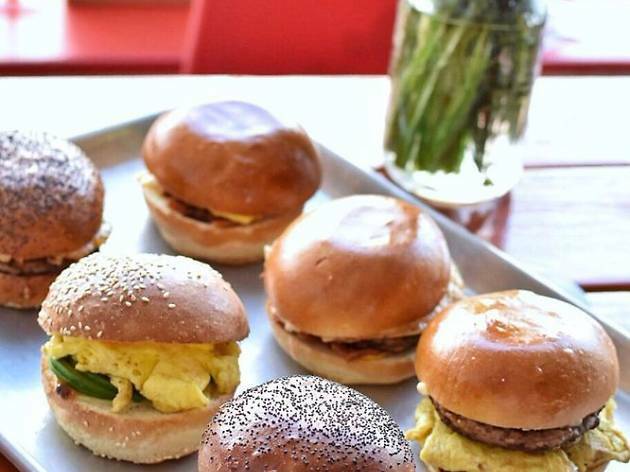 Lines form each morning for the “breakwiches,” heaping breakfast sandwiches filled with your choice of fried or scrambled eggs, cheese, and toppings like sausage, bacon, and avocado. 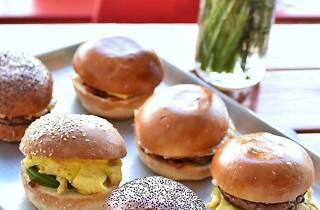 Build your own—on a bagel or roll—or order one of the specialty stackers, like the Kap (scrambled eggs with cherry peppers, fried capicola, and muenster cheese on a sesame roll) or the Grand Papa: scrambled eggs, bacon, sausage, and American cheese, on an onion poppy roll. The bagels are shipped fresh from New York.